"K&L". Brass case. Brass shackle. 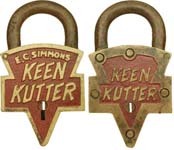 "E. C. SIMMONS KEEN KUTTER" - "KEEN KUTTER". 3 3/4" high x 2 1/8" wide x 1/2" deep. Brass case. Brass shackle. 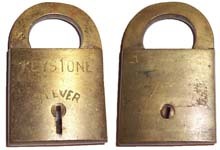 Some locks have one or more of the following stamped on them in vaious locations: "PAT 1-2-06", "TRADEMARK", "REGISTERED". Made for: Simmons Hardware CO. Archer W. Douglas Patent # D37771. 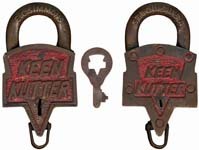 "KEEN KUTTER" - "KEEN KUTTER" - "E. C. SIMMONS" - "ST. LOUIS U.S.A.". Brass case. Brass shackle. 3 3/4" high x 2 1/8" wide x 1/2" deep. 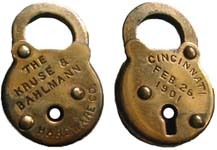 Some locks have one or more of the following stamped on them in vaious locations: "PAT 1-2-06", "TRADEMARK", "REGISTERED". Made for: Simmons Hardware CO. Archer W. Douglas Patent # D37771. "KEEN KUTTER" - "KEEN KUTTER" - "E. C. SIMMONS" - "ST. LOUIS U.S.A.". 3 3/4" high x 2 1/8" wide x 1/2" deep. Brass case. Brass shackle. 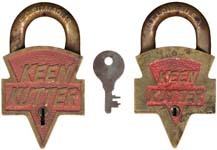 Some locks have one or more of the following stamped on them in vaious locations: "PAT 1-2-06", "TRADEMARK", "REGISTERED". Made for: Simmons Hardware CO. Archer W. Douglas Patent # D37771. 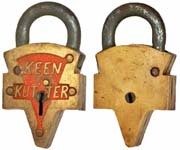 "KEYSTONE 3 LEVER". 2 5/8 high x 1 11/16" wide x 1/2" deep. Brass case. Brass shackle. Mfg by: E. T. Fraim Lock Co.
"KING BEE". 2" wide. Brass case. Brass shackle. The reverse of the lock is blank. Mfg by: Eagle Lock Co.